High school students don’t always think about money when considering a school. Talk to them before they get their heart set on specifics and help them understand the financial responsibilities with certain majors and types of schools. Start early. This will be an ongoing conversation. 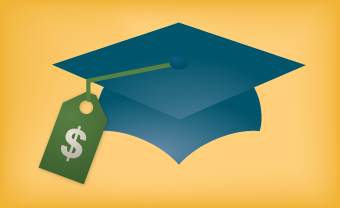 Begin to discuss the cost of college with your child as early as middle school. Open up about details. Explain what you’ve saved, what you’re willing to spend, and the cost of 4 years of college and beyond. Then, outline other funding options such as loans. Put it in terms they understand. Your child may have trouble comprehending what $30,000 in student loans means. Break that number down into what they would have to pay each month. Tuition and fees vary widely. Public in-state schools are usually significantly less expensive than private or out-of-state options. But keep in mind that private schools may actually cost less if your child qualifies for financial aid. ROI. BestColleges.com publishes a list every year ranking schools based on their return on investment (ROI). The list takes into account the true cost of attending a school weighed against the median earning power of its graduates over 30 years. Your child’s long-term goal. Students with a clear career path may want to pay more for a college that specializes in that major. The best setting for your child. If your state’s best public college is a large, overwhelming institution and your child thrives in a smaller setting, you may want to look at other options. The good news: Most states have more than one choice. When researching schools, community colleges usually jump out as the cheapest option. Students can take introductory classes at a 2-year community college, then transfer to a 4-year school. According to a survey by the College Savings Foundation, 25% of families plan to use this transfer strategy. Most high school students know they can test out of college classes and get credit if they do well on Advanced Placement (AP) tests. Two other tests also allow students to earn college credit: the College Board’s College-Level Examination Program (CLEP) and DSST, which was previously offered only to military personnel but is now available to all. Students need to study on their own. Most schools won’t prepare students for non-AP college exams. However, now students can get help online. The nonprofit Modern States recently teamed with CLEP to offer free test-prep courses. Not all colleges accept the credits. Be sure to check with individual schools to learn about their policies. About 2,900 colleges accept CLEP; fewer accept DSST. The exams only cover introductory classes. Testing out of freshman year can save a lot of money, but this approach won’t replace higher-level classes. More privacy. Many commuters say they love not having to deal with an unknown roommate and shared bathrooms. A built-in support system. While many students love the freedom they get living on campus, many miss the support their families offer. Parents who give students more independence while they live at home can provide the best of both worlds. Steady job prospects. Students often leave behind decent part-time jobs. If they stay home, they can usually keep working. As a bonus, those jobs can provide valuable experience when students apply for full-time positions. Applying for scholarships is a great way to reduce the cost of attending college. Even if your child isn’t on track to be the next basketball star, he or she still might qualify for an academic scholarship or other type of aid. Many private colleges offer generous aid packages. If your income falls below a certain number, it’s worth taking the time to uncover the real price tag for private schools. However, if you make too much money to qualify, your child can still apply for private grants and scholarships. According to Sallie Mae’s most recent report, 35% of college costs are currently covered by scholarships and grants. If you’ve been saving in a 529 plan for years, but it’s only a small portion of what you’ll need to pay for college, don’t feel discouraged. You can make the most of what you have by combining it with creative cost-cutting strategies. Besides, the fact that you have a college savings plan makes it more likely your child will attend college, no matter how much you have saved. *Elliott & Beverly, 2011. The Role of Savings and Wealth in Reducing “Wilt” Between Expectations and College Attendance. Journal of Children & Poverty.